All bathrooms are not created equal. Some have all that you need to care for normal bodily functions, and others don’t. You might think, well, some bathrooms do offer tampons. This is true. Some bathrooms offer tampons in a dispenser that requires a quarter, or worse, a dime. However, more often than not, these dispensers are either out of stock or broken altogether. Even if they work, who carries a quarter on them? Offering free tampons eliminates the messy, emotional ordeal menstruators must go through when caught without a tampon. While it is important to be a part of the menstrual movement, provide basic bathroom necessities, and eliminate shame and anxiety surrounding menstruation, offering free tampons also has a positive financial impact. According to a study conducted by Free The Tampons, 86 percent of women have started their period in public without access to the menstrual products that they need to function throughout the day. To illustrate the loss of productive working hours, assume a company has 1,000 employees, and 50 percent of those are female. Decrease that number by 20 percent to account for those who may not be menstruating. You have 400 potentially menstruating employees. Let’s say 86 percent of those employees unexpectedly start their period just once per year and must spend the day distracted and humiliated. That is 2,752 lost hours of productive working hours. When a company doesn’t offer free tampons, they are missing out on valuable talent acquisition opportunities. When women are choosing where to offer their talent and dedication, rankings for best workplaces for women count. Offering free tampons showcases a tangible commitment to women in the workplace, and can increase a company’s odds of scoring that talent, and the profit that comes with it. So, you’re convinced, but how do you begin offering free tampons in your workplace? 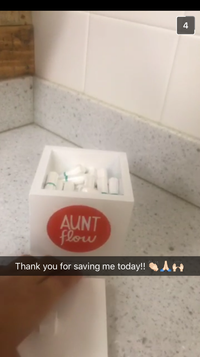 Aunt Flow works directly with businesses to make sure the workplace is equipped with tampons. We believe every person should have access to basic menstrual products, and we accomplish this by offering 100 percent organic cotton feminine hygiene products to businesses so that they can provide them to their employees and customers for free. Bonus! For every 100 tampons purchased by a company, 10 are donated to an organization of their choice.